February! It might be the shortest month, but there’s no shortage of events and things to do in Prince Edward County over the next 28 days. There’s something for everyone – including those who thrive when the temperature drops, and those who’d prefer to watch winter from afar. ICE BOX is a new outdoor art event taking place February 2-10 at Picton’s historic Macaulay Heritage Park. Brought to you by the same folks behind the much-loved Firelight Lantern Festival, The Department of Illumination will transform the grounds of the Museum into a festive gathering place with dancing, a parade, live music, storytelling and theatrical performances. At the centre of the event are are five ice boxes – colourful wooden huts, each transformed into an interactive art installation led by local artists in collaboration with community members of all ages. All the How-To details are here. The Drake Devonshire’s 3rd Annual Barn Burner is a match made in food and hockey heaven. On Saturday, February 2nd, chefs from coast-to-coast will face-off for a hockey game that you can really sink your teeth into. Your ticket to the hockey match (3:00 PM) gets you a family skate before the game (1:30PM) and access to the chef-run gourmet concession stands in the arena. The post-game party at the Drake Devonshire includes a full strolling dinner. Buy your tickets online. Be the first to know how many more weeks of winter are in store by joining Three Dog Winery for their 5th Annual Groundhog Day Party. Work up an appetite snowshoeing, walking or cross-country skiing the back-40 then roast s’mores and hot-diggity’s over the open fire (free!). Build your own charcuterie plate and enjoy $7 wine by the glass. If you’d rather watch winter from afar, what better time to pick up a paint brush and unleash your inner artiste. Paint with Kato! 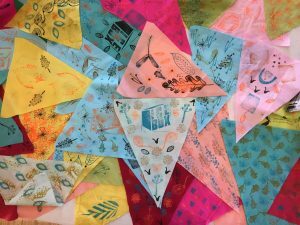 is an open studio class at the Baxter Centre combined with personal coaching so you can work at your own speed in a relaxed and happy atmosphere. Come for half a day or the whole day. Beginners welcome. There’s no shortage of dance parties in PEC this Feb. Get funky at Cue The Funk’s Valentine’s Dance Party taking place at the Wellington Legion on Friday, February 8. Are you somewhere on the LGBT rainbow and want to dance the winter away with a funk-heavy, crowd-sourced playlist!? Come, be fabulous with your family at the PEC Queer AF Dance Party. taking place at the Yacht Club on Saturday February 16. Flashback February is a a nod to The County’s past and a week of hands-on learning, live demos, talks, film screenings, and stories. 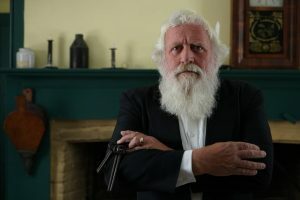 Look forward to a new Escape Room, Heritage Wine Tours, Cookbook Roadshow, improv with Taste That, a Paranormal Show, an organ concert, trivia and so.much.more. Talented chefs, local organizations, experts, curators, artists, and innovators will be on hand to spark conversation, lead activities, and dig into our rich history. 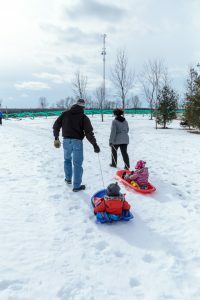 Sandbanks Family Day welcomes winter enthusiasts on Monday February 18 for a day of cross-country skiing, snowshoeing, hiking, tobogganing and more, with a jam session, hot chocolate, chili and a kid-friendly performance about the Route Champlain. Sophiasburgh Winter Festival is at the SophiasburghTown Hall on Saturday February 16 from 9am-7pm. Enjoy outdoor skating and plenty of family-friendly winter games. The pancake breakfast and fish-fry will keep you fuelled all day long. The Lion’s Club, The County, Wellington Rotary and the Wellington Rec Committee invite you to The County Family Day – a day of family fun, games and activities! Public skating from 9am – 3pm. What do you get when you combine Winter + Vintner? Vinter Fest! 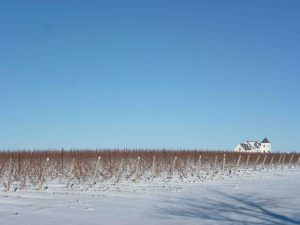 Over Family Day Weekend, visit one of 12 participating Vinter Fest wineries for all things winter, art, food and wine pairings. If winter’s got you down and you’re craving comfort, Hinterland Wine Co’s 6th annual Hinterlude – taking place February 16-17 – includes a comfort-food competition! Dress warmly and show winter who’s boss. Family-friendly event with free entry. 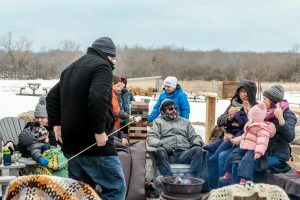 Karlo Estates hearts winter and you can too at their annual Ski-Doo / Ski-Bunny Dance Party and their Ice Moon, plant-based dinner where you can embrace the (hopefully) last of the coldest days of the year.